Join us at the Jam! 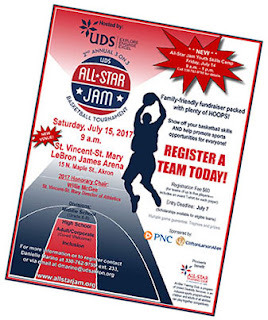 for the 2nd annual UDS All-Star Jam 3-on-3 Basketball Tournament fundraiser! There'll be food, fun and plenty of HOOPS! Registration is now open! Contact Danielle Marino at 330-762-9755, ext. 233 or dmarino@udsakron.org for more details or to register your team today! This year we've added something new and fun for youth in grades 3-8 looking to up their game! 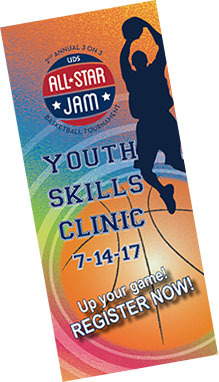 Boys and girls of all abilities are invited to participate in this free 1/2-day basketball skills clinic on Friday, July 14 at the St. Vincent-St. Mary LeBron James Arena. For more information or to get a registration form, contact Renee Pieronek by calling 330-762-9755, ext. 241 or email rpieronek@udsakron.org. Visit us at AllStarJam.org today!